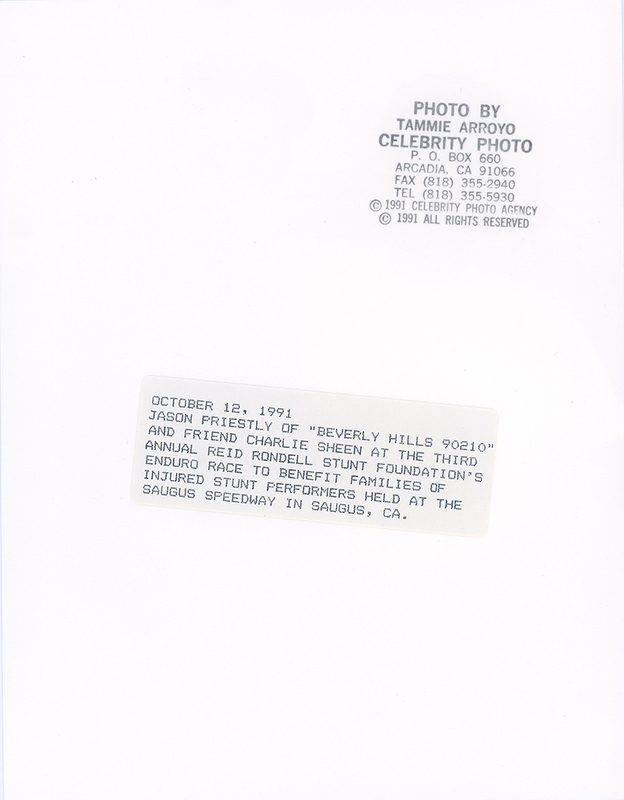 SCVHistory.com LW3005 | Saugus Speedway | Jason Priestly, Charlie Sheen at Benefit for Families of Injured Stunt Performers, 1991. 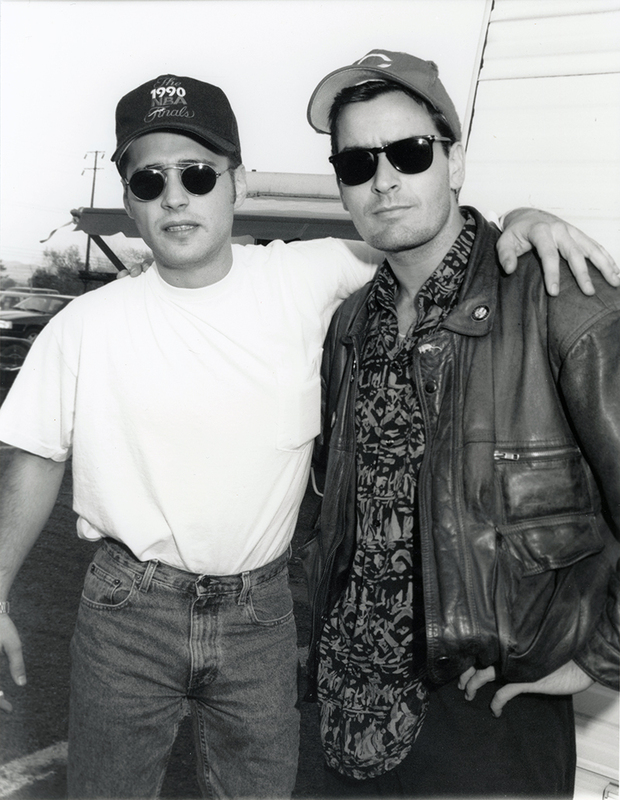 Jason Priestly of "Beverly Hills 90210" and friend Charlie Sheen at the Third Annual Reid Rondell Stunt Foundation's Enduro Race to benefit families of injured stunt performers held at the Saugus Speedway in Saugus, CA. 8x10 glossy photo by Tammi Arroyo, Celebrity Photo, Arcadia, Calif.
Twenty-two-year-old Reid Christian Rondell was one of Hollywood's youngest stunt coordinators when he died in a helicopter crash in the Santa Clarita Valley on Jan. 18, 1985. Rondell was the only passenger in a Bell 205 helicopter piloted by Scott Maher, 46, who had to be pulled from the wreckage. As part of a chase scene with another helicopter for an "Airwolf" episode, Maher had just made a third pass through Potrero Canyon, flying within 200 feet of the ground, when his chopper smashed into the side of a hill and burst into flames. Maher was rushed to Henry Mayo Newhall Memorial Hospital in Valencia where he was treated for a concussion and bruises. Rondell was pronounced dead at the scene. An autopsy determined he died from burns. The helicopter was not one of the show's three signature futuristic helicopters, which are modified twin-engine Bell 222s. The crashed chopper was the civilian equivalent of a Huey. Rondell (b. July 11, 1962, in Los Angeles) was doubling for actor Jan Michael Vincent, who was not present. Vincent was working with costar Ernest Borgnine at a different location that day. Reid Rondell came from a family of actors and stuntmen going back to his grandfather, Ronald R. Rondell ("Around the World in Eighty Days," "Alfred Hitchcock Presents"), who immigrated to the U.S. from Italy. Reid Rondell ("Taps," "Risky Business," "St. Elmo's Fire") was Tom Cruise's preferred double, and he served as coordinator on the 1983 Tom Cruise vehicle, "All the Right Moves," as well as "No Small Affair" (1984) starring Jon Cryer and Demi Moore. LW3005: 9600 dpi jpeg from original photograph purchased 2017 by Leon Worden.